Mount Lineland is a mountain ahead of Lineland Road, nestled before Yold Desert. And so Mario came to learn the stupendous ability of flipping between dimensions. But there was no time to celebrate: Mario still had a Pure Heart to find. The trail ahead was overrun with savage beasts. "Follow me," Tippi said, as she flew toward the mountain that loomed ahead. The Pure Heart was hidden somewhere on the other side. Thwomps in an underground section. Mount Lineland is a rocky region that requires Mario to climb many hills and mountains. At the start of the level are four ? Blocks and three Paratroopas. Further on is a tall mountain with a red Koopa Troopa nearby. In 3-D, Mario may find a hidden path behind the mountain, leading to a small room containing a Paratroopa Catch Card and a door that allows Mario to skip some of the level. At the top of the mountain is a system of flipping rectangles. By standing in the red square at the start of the system, Mario can be carried to another area by the rectangles. There he will find a blue switch in front of a square block. Pressing the switch will create another mountain for Mario to scale, with more flipping rectangles at the top that will deliver him to a door. Through the door, over a pit and past a Koopa Troopa, Mario will find a wall too high to jump that he must pass using blocks found in 3-D. Higher up are more blocks that Mario can use to get on top of a line of hard blocks, on top of which are some Koopas and Paratroopas. There is also an area to the left where the hidden door at the beginning of the level leads. Past the hard blocks is a huge mountain with several Spiny Tromps rolling down. At the top of this mountain is a door leading to Impasse Pass, a chasm too large for Mario to cross. Mario must use a Warp Pipe leading into the background, where he will find a house. The house appears to be empty, but in 3-D, Mario will find Red, a man trapped in 3-D. Panicking, Red asks Mario to flip back to 2-D with him. It works and Red asks how he can repay Mario. Tippi tells him that they need to cross the chasm outside and Red says that he can help, but only if Mario answers a question correctly. He then asks Mario what his favorite color is. If Mario answers "Green" or "Both", Red gets angry and kicks Mario out, but if he answers "Red", Red agrees and pulls a lever that creates a bridge across the chasm. Across the chasm, Mario finds Yold Town and at the other side of the town, an even larger chasm. Mario meets the town's mayor, Old Man Watchitt and tells him that he is the hero and needs to pass. Watchitt refuses to believe Mario, though, because he was told the hero would have a Pixl shaped like a hand. Inside an empty house, Mario finds a pipe leading underground. In this area is a row of Thwomps that must be passed in 3-D. Through the door at the end of the room is a seemingly empty room with an invisible door that can be revealed by Tippi. In the next room, the door seals itself, trapping Mario and Tippi. Mario opens the large chest in the room and frees Thoreau, a Pixl with the ability to grab and throw things. Mario uses this ability to throw a block at a switch, opening the door. Mario returns to Watchitt, who sees that Thoreau is shaped like a hand. He calls Green the bridgemaster and tells him to let Mario pass. Mario visits Green's house and the bridgemaster uses his lever to create a (noticeably larger) bridge across the chasm impeding Mario. Afterward, Green asks Mario what his favorite color is. No matter what Mario answers, Green gets angry and kicks Mario out. 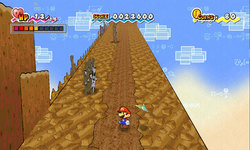 Across the green bridge, Mario finds the Star Block that signals the end of the level. "This rocky region features scenic mountain peaks. Yold Town lies over the mountains. The mayor is a descendant of the Ancients named Watchitt. You met a Pixl named Thoreau under one of the houses." Yama o Koete Rettsu Go! Cross the Mountain, Let's Go! This element of geography has been used in the original Paper Mario, in which Mt. Rugged was nestled before Dry Dry Desert. In fact, the mountain's environment is also similar to Mt. Rugged, despite its lack of Monty Moles, Clefts, or even some sort of bird. This page was last edited on March 4, 2019, at 13:08.